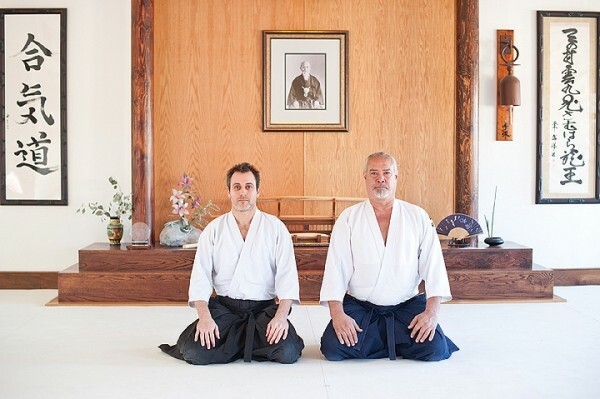 At Utah Aikikai, you’ll find sensei Rick Berardini (right) and senior instructor Marc Fisher (left), who live and teach the art of peace—the Japanese martial art of aikido. Utah Aikikai (3474 S. 2300 East, Suite 12, Millcreek, 801-891-8945, UtahAiki.com) is one of the largest aikido dojos in the United States and is open seven days a week with classes for people of all ages. Members of the Utah Aikikai dojo will be demonstrating aikido during the free Nihon Matsuri festival on Saturday, April 26 (100 South between 200 West and 300 West, 10 a.m.-5 p.m., NihonMatsuri.com); the performance will be at 1 p.m. on the east stage directly behind the Salt Palace. Rick Berardini: Karate is a competition fighting sport, so it’s all set up around competition, and it teaches you how to fight. Aikido is a full-blown self-defense martial art. It’s made to put people in a position in which they are somewhat subdued, and you can take it from there. You can take it to the ground if you need to. A lot of cops are trained in light aikido in order to learn handcuffing techniques. During submission, you can handcuff somebody pretty easily. There’s a lot of joint locks, joint manipulations, throws, stuff like that. With aikido, all we have to do is get a hold of you. Marc Fisher: Karate is also more offensive, while Aikido is more defensive. Aikido uses the attacker’s energy and harmonizes with it. That’s where you get the throws and the joint locks, because you’re keeping that energy continuous. You don’t want to stop the attack; you want to keep that energy going. A lot of the time, people look at aikido as being orchestrated, but it’s not; it just flows. Are there health benefits to aikido? RB: You have these spurts of cardio when you’re doing hard techniques, and taking falls is when you’re getting the most exercise. You’re not only learning how to protect yourself, you’re improving your health, you’re cross-training. You also really start to learn about your body and how it works when you put a weapon in your hand—not like a gun, but like a practice sword. I can see on each person a different level of stress, anxiety, nervousness, and I’ll stand there and say, “Relax,” and they’ll relax and I’ll say, “Well, you’re still not relaxed, but you’re more relaxed than you were a few minutes ago.” You see this constant progression of relaxation in people from when they first start until they reach a point of ability. They start to really learn how to relax doing it. Weapons are important in that they build character and help you find a point that you haven’t been able to find before, where you’re relaxed and comfortable and have your center and everything else you need. MF: The best benefit of aikido, at least for me, is the path. I don’t just come here to train and that’s it; it’s taken over my life in terms of how I function every day, whether it’s in work or relationships, etc. Once you really understand the philosophy of aikido, I think it changes your life. Practicing the martial art just enhances that. It’s conflict resolution in a peaceful way. Another benefit of aikido for me is the self-confidence it gives. We’ve had a lot people come in here who’ve been shy or a little more introverted, and through aikido, because you do demos in front of a class or in front of us, you learn to have self-confidence, and you see people change in front of your eyes. Throughout the months or years, you really see them change as a person, and what that does to them, money can’t put a price on that. Have you ever used aikido in real life for self-defense? RB: I have, a couple times. One time I was at Dan’s, right over here in the parking lot, talking to my wife on the phone, and out comes this kid holding something. Right behind him was this girl sprinting out the door, and I just thought it was a guy and his girlfriend. They came past me and she goes, “Drop it!” and I said to her, “Just get his license-plate number and call the cops.” And just as I said that, the guy turned on this girl and put his hands up, so I hung up the phone, walked up and pushed her out of the way and said, “Try hittin’ me.” And he came at me and I got him in a joint lock, and marched him back into the building—everybody was all excited. I have used it. Not in any grandiose way; it’s just quick and dirty and, you know, you’re right there. I can’t see someone getting beat and just watch. Most people will just stand there. I used to bounce a lot back when I was younger, and you just have to take it upon yourself to be the guy that will stand up and save the other guy. How did you get into aikido? RB: It was kind of a convoluted thing, I was doing other martial arts and I met an aikido instructor that happened to live behind me; we shared a fence. That was really my first introduction to it, but I never really did it at first because I was still into the fighting martial arts. It took me a long time to try and figure it out. When you’re in a high, aggressive martial art, your anxieties and other things run at a high level, and learning to relax was really against everything that I was doing at that point in time. When you watch professional boxers, they’re pretty relaxed because they have to be. If you’re not, your wits aren’t about you. If you get to a point where you’re not relaxed, everything goes away and you’re pretty much a lunatic looking at whatever’s in front of you. Once you learn to relax, you can take in everything that’s around you and deal with it that way. MF: I’ve always wanted to do martial arts but my parents would never put me in it; I always had to do baseball or soccer. So finally my mom put me in one of those continuing-education night classes. I thought it was really cool, but I was a little too young to understand it. Aikido got stuck in my mind until I went to college in San Francisco, and I always remembered that experience, so then I joined there. Then I moved here and found Berardini Sensei and it’s been a part of my life ever since. What is aikido’s presence like in Utah? RB: For the longest time, before 2008—which is the Great Depression of the modern days—we were one of the biggest dojos in the country. I think our high was about 140 students. Recreational activities like martial arts or ballet classes are the first to go when you have to tighten your belt. You constantly have this turnover in any martial art—probably about 85 percent of people that try it will not continue. Our dojo has gotten leaner and meaner as far as how we have to operate because we don’t have the luxury of having 100-plus students, which is a very big dojo by any standards. Is there a non-intimidating way to get into aikido? RB: We always have people come in to watch a class when they first come in. By seeing a class, they can really get a feel for it. And if we can accommodate them, we’ll even put them on the mat and let them try a class. We usually like to make a time for them to come in, but sometimes it works out where they can just show up and we can pay them attention. To me, the most important person on the mat is the new guy. I just remember in karate being that new guy. And in karate, it’s all about doing kata in front of the mirror. You can always see that new guy in the back—everyone can see him—and he’s back there floundering. It’s not like that here. In aikido, we never do solo kata, only in pairs, so that you never get stuck being that one new guy where you just wanna go crawl in a hole and leave. It’s really hard for some people to come in and be that new guy that first week or two. Here, your partner and everyone helps you out. Is there a movie like The Karate Kid that feature aikido? MF: The best movie for Aikido is Above the Law by Tom Segal, which really publicized aikido when it came out. What’s the Nihon Matsuri festival like? RB: It’s one of the bigger culture festivals in town. You’ll see people walking around dressed up. My wife’s Japanese, you’ll see her walking around in her kimono, a real one. They’ll have women dancing and kids doing martial arts and people doing various other things. Then the younger kids dressed up as anime characters and Harajuku Girls.